Violet loves to tell stories to her baby brother, Peter. This time she’s narrating them right into their own fairytale. If you love stories of imagination, such as Little Red Riding Hood, Where the Wild Things Are, and Charlie and Lola—you’ll adore spending time with these two courageous siblings. 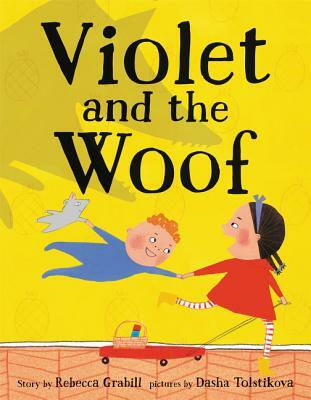 Riding their building’s elevator and traveling the hallways past apartment doors to bring soup to a sick neighbor, Violet and Peter encounter both real and imagined adventure—getting lost in the laundry room, running into a troll, and escaping scary noises in the nick of time, only to find that their poor sick neighbor looks . . . like a wolf! Rebecca Grabill would love nothing more than to pack up her wagon and go on a “journey fraught with danger and peril,” but the closest she’s come (so far) is a road trip to NYC with her five children during a blizzard. When she’s not journeying, Rebecca lives and writes all sorts of adventures in rural Michigan with her husband, children, cats, and chickens. Her first picture book was Halloween Good Night, illustrated by Ella Okstad. You can visit her at www.rebeccagrabill.com. Dasha Tolstikova was born in Moscow and made her first illustrations when her mother sewed up small pamphlets of paper for her to create tiny books. Now Dasha illustrates bigger books, such as The Jacket by Kirsten Hall, a New York Times Book Review Notable Children’s Book; If a T. Rex Crashes Your Birthday Party by Jill Esbaum; and Friend or Foe? by John Sobol. She is also the author and illustrator of a graphic memoir, A Year without Mom. She lives in Brooklyn with a menagerie of roommates and her dog, Muffin. You can visit her at www.dashatolstikova.com.